The people of Crimea, from what I've heard, would rather be with Russia than where they were. Politifact confirmed the quote and looked into reports at the time about whether this demonstrated ignorance of the "geopolitical developments" in Crimea. "Okay, well, he's there in a certain way, but I'm not there yet," Trump responded. "You have Obama there. And frankly, that whole part of the world is a mess under Obama, with all the strength that you're talking about and all of the power of NATO and all of this, in the meantime, he's going where — he takes, takes Crimea, he's sort of — I mean. …The people of Crimea, from what I've heard, would rather be with Russia than where they were." Many news outlets interpreted this as Trump’s ignorance. But it’s not entirely clear if the ridicule is completely warranted. So we’re not putting Trump’s statements on the Truth-O-Meter, but we did want to examine Russia’s presence in Ukraine more in-depth. Let’s brush up on some modern Eastern European history. This old story was revived today by a quote-tweet by Rick Wilson, retweeted by David Leavitt, who is currently a Twitter verified user, the accuracy of the claim called into doubt by many tweeters (for example). The impression I have is that the Soviet Union "ethnically cleansed" Crimean Tatars living there, leaving the place with a high proportion of ethnic Russians, many of whom nowadays prefer to be with Russia than Ukraine. In 2016, did the Crimean people want to be aligned with Russia or Ukraine? Note: This isn't about whether the Crimean referendum is legal, or whether Russia's annexation of Crimea is legal. The vast majority of the Crimean population would vote for the status quo in a future repeat referendum on Crimea’s status and express trust in Russian state institutions. The Crimean Tatars remain much more sceptical of the current regime. 84% of non-Tartar Crimeans would preferentially describe themselves as Russians citizens, whereas only about half of the Tartars do that. 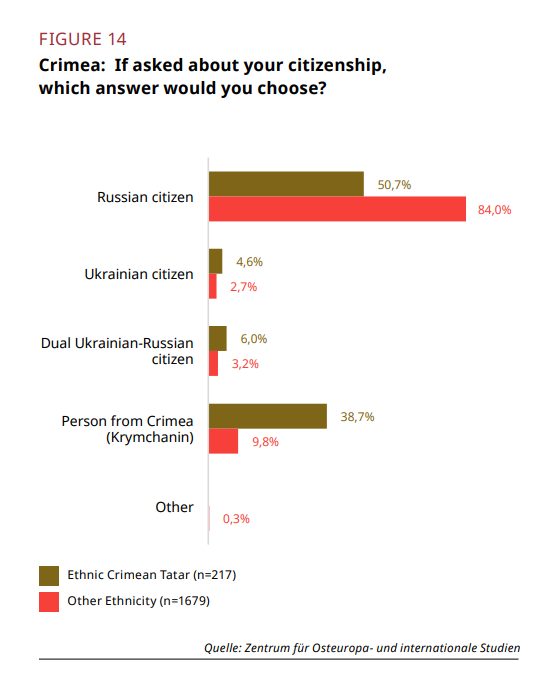 Also, a couple of questions later (fig 17), 67.8% (of the total) described themselves as "ethnic Russian", followed by "Ethnic Crimean-Tartar" 11.7% and 8% "mixed Russian-Ukrainian" and 7.5% "ethnic Ukrainian". And (fig 20) 83% of all respondents declared they only speak Russian at home. Finally (fig 38) 83.4% of non-Tartars would vote the same same as in the 2014 referendum, whereas only 49.2% of the Tartars would do that. The combined percentage of Crimeans who would vote the same was 78.8%. This probably answers all your potential questions. I was a bit surprised such a detailed survey was conducted. A Gallup poll with the Broadcasting Board of Governors asked Crimeans if the results in the March 16, 2014 referendum to secede reflected the views of the people. A total of 82.8% of Crimeans said yes. The GfK poll (P. 7) finds that only 4% of Crimeans do not support the accession of Crimea to Russia. Not the answer you're looking for? Browse other questions tagged russia ukraine .